Guest Post Wednesdays: It's All in the Family by Marge B. The BIG CHANGE is coming very soon and you'll soon know, I promise. For now, I'm trying to bring back some sense of normalcy around here. So sit back relax, because ta-dah my Guest Post Wednesday feature is back. Today's guest blogger is Marge. I've always known her to be a foodie even before the word foodie came about. She would lug with her loads of homemade goodies during her annual trips to Florida which made me suspect that she carried more bags of goodies than bags of clothes! 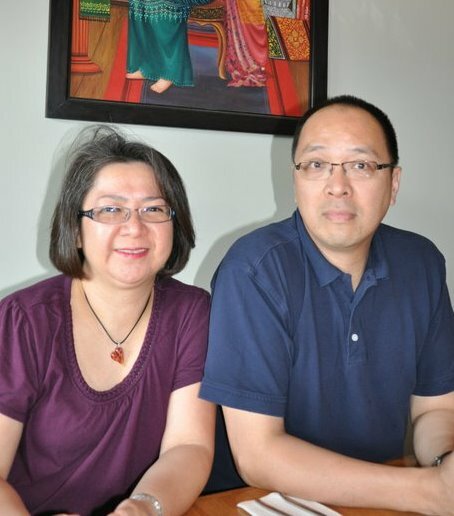 She together with her husband Patrick, would have us indulge with good food and good wine whenever we get together. I'm glad that the wrath of Irene didn't stop her from submitting a post. 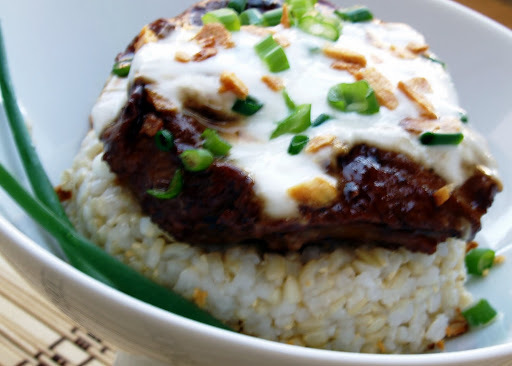 Yep Marge hails from New Jersey and today she's sharing with us a coconut dish from her father's cookbook called The Coconut Cookery of Bicol. Grab a chair, join us, as we welcome Marge General-Bautista! My familial relation to Malou is quite distant. In Western standards, we aren’t considered family. Malou is the younger sister of the wife of my husband’s first cousin on the father side. Were you able to follow that? It does not matter to the Filipino how distant our relation is we are all considered family once there is a connection. Everyone is considered an aunt or an uncle or a cousin. And Malou and her family have become family to us through the years spent vacationing in Florida. A few years back, while vacationing in Florida with cousins, Malou and I were seated beside each other in the back of the vehicle during one of our many trips to somewhere. We started talking about needing and wanting to pursue a career involving our love for food. You see, Malou and I are both foodies. We love to cook and bake and eat with gusto. 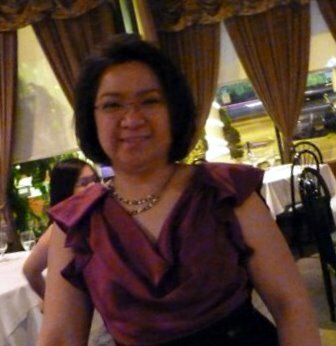 I was so thrilled for Malou when she started this blog and most especially when she found a following. I love Malou’s gift for gab. It made many a visits to Florida fun and memorable. I, on the other hand, can get tongue tied quite easily. So, one can only imagine my reaction to Malou when she asked me to be her guest for her blog. “ME? I won’t be able to write anything interesting?” I told her. She told me to just do it and it’ll come, so here I am. My husband is a foodie as well. We both love to cook, bake and most importantly, eat good food. My husband is a certified sommelier and that has brought up our level of awareness for good food a few notches. Good food especially paired with good wine is always a source of excitement for my husband and me. My husband and I come from families of foodies as well. My husband’s youngest brother is a chef back home in Manila. 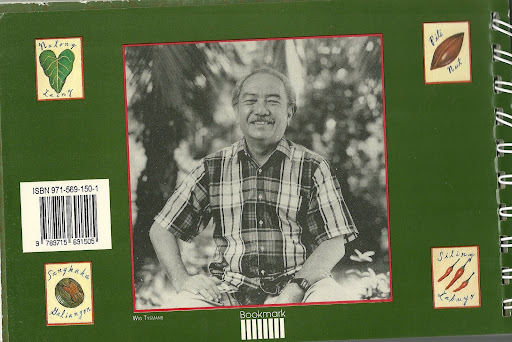 In 1994, my father published a cookbook called the “The Coconut Cookery of Bicol”. My father wrote about what he grew up cooking with – coconut milk. He comes from the region of the Philippines where coconut trees grow in abundance and is used in all sorts of cooking. Have you ever heard of ripe guavas cooked in coconut milk? Yummy!! 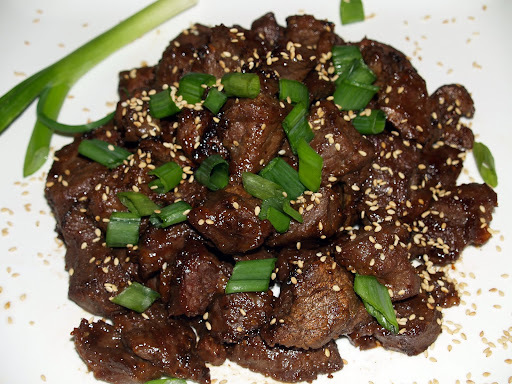 How about dinuguan or adobo cooked with coconut milk? Equally as yummy! 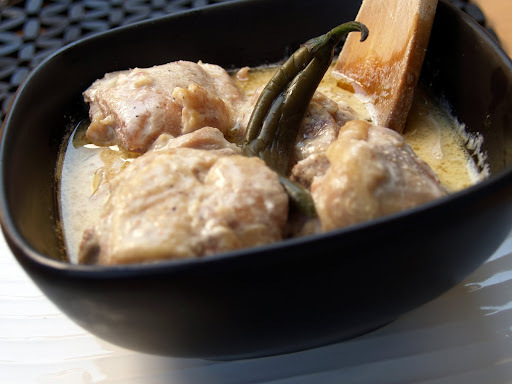 Chicken adobo cooked in coconut milk is one of my favorites and I had asked my dad to cook it for me during one of his visits to my home in New Jersey. I can never cook it as well as my dad can. And I would like to share the recipe with you. As with anyone who cooks from memory and by taste, measurements will vary. That is how my father cooks, so feel free to adjust the amount of the ingredients to your liking. Cut the meat into portion-size pieces. In a wok, heat some cooking oil. Fry the garlic until lightly browned. Add the meat and increase the heat to high. If you are using both chicken and pork, add the pork first, allow to cook for about fifteen minutes before adding the chicken. Stir frequently to ensure even cooking. Add the peppercorns, vinegar and salt. Continue cooking until almost all the liquid has evaporated. Add the coconut milk. When the milk comes to a rolling boil, reduce the heat to medium until the meat is tender. In the last few minutes, add the bay leaves. I like this recipe both on the dry side (with almost no sauce and the coconut oil already extracted from the milk) or with some sauce remaining so that I may add it to my rice as I am enjoying this. Pairs well with Chardonnay or Riesling. There you have it. A dish with suggested wine pairings to boot. Thank you Marge for gracing my blog. I truly appreciate the time and effort you put in to share your recipe and to write this post. I hope to have Patrick do a post for me soon??? Did I hear a "yes?" Oh there you have it folks, we have a sommelier as a guest blogger in the near future! To my dear readers, let's show Marge that we enjoyed this post. Can you please give me a show of hands people? ok one, two, three... anymore? Haha yeah your comments are greatly appreciated. Til the next Guest Post Wednesdays folks! Enjoy the rest of the week. 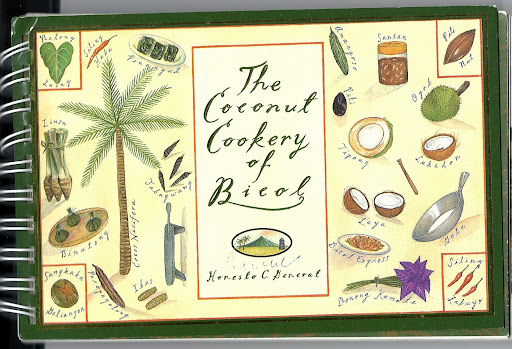 A few months ago, Marge sent me her dad's cookbook: The Coconut Cookery of Bicol. I treasure it so much as it is one of the last copies available, and it was a signed copy! Here are some snapshots Thanks again Marge! 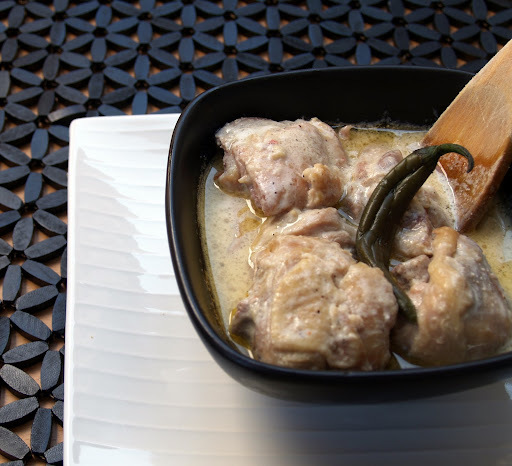 Here's how Adobong Manok sa Gata looks like when reduced to dry. With the end of August upon us, a lot of kids are back to school. Some are starting a new phase in their lives and it could be a daunting challenge for them. Our role as parents is to make this transition smooth for them. And the best way to make this happen is by serving them hot meals when they get home. A better way to do this is to welcome them with a savory dish. Its aroma will meet them as soon as they open the door, as they throw their bags to the ground and come running to the kitchen. Soon you will hear them say: "that smells good mom"
Beef is a good source of iron. 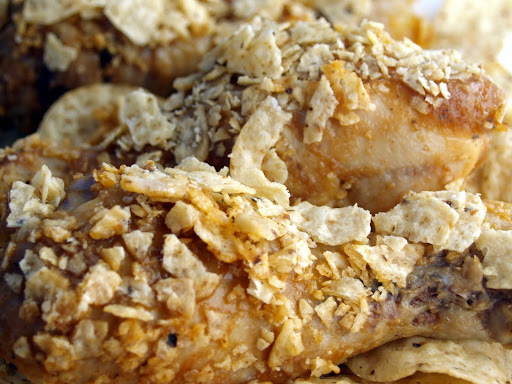 I like serving it to my kids as it gives them energy and makes them alert. Kids love meatballs so it's a fun way to give them essential minerals, well at least in meatball form. Combine oyster sauce, garlic salt , carcked egg pepper and sesame oil. Mix it well until all ingredients are fused in together. Now add the ground beef. I do it this way so that the ground beef will not be mushy and won't lose its ground texture. Shape into small meatballs about a tbsp spoon full. 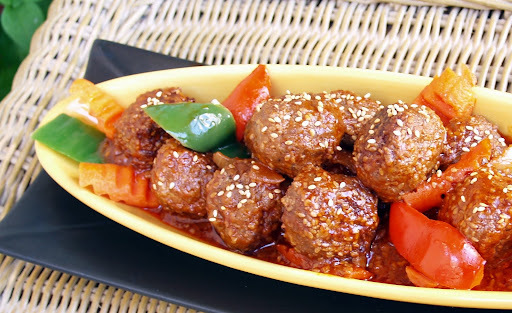 Roll the meatballs on a pan of sesame seeds. Put 2 tbsp oil on a wok. Cook the meatballs until they are brown on all sides. Set aside the cooked meatballs. Using the same wok saute garlic and onions. Add the ginger. Pour vinegar, ketchup and sugar. Let it simmet. Add meatballs and allow the sauce to coat all the meatballs. Add vegetables. Cook for about 4 minutes or when vegies are cooked. Word of caution though, do not overcook the veggies. I am sorry for not posting a new entry for over a week. But I know you will understand when I tell you the reasons why. First, I sent my son to college last week. So imagine all the prep work and the emotions that went with it. OMG, I couldn't write nor cook! LOL! Second, we are in the midst of a change. As if the separation anxiety I had with my son wasn't enough, there's a big CHANGE happening soon. I think I am not ready to divulge that yet though... please allow me some time to let it sink in first... and yes today is my birthday (technically since I was born in the Philippines), as a birthday treat I got the biggest thrill in my blogging career so far. I am a guest blogger for one of the top finalists in this season's MasterChef's. Have you watched an episode of the cooking challenge show on Fox called MasterChef? Yes, I am a fan of the show. When season 2 started, I became an instant fan of Alejandra Shrader. Her true character in the show stood out. I love her kind aura, and she was not your usual pushy, abrasive, cooking show contestant on camera. She was the sweetest, and very talented! Please hop on to her blog and know the story behind how we "met" in my guest post On Masterchef, Tweets and Lamb Spring Rolls. I promise you a great story and a great recipe so see you there! 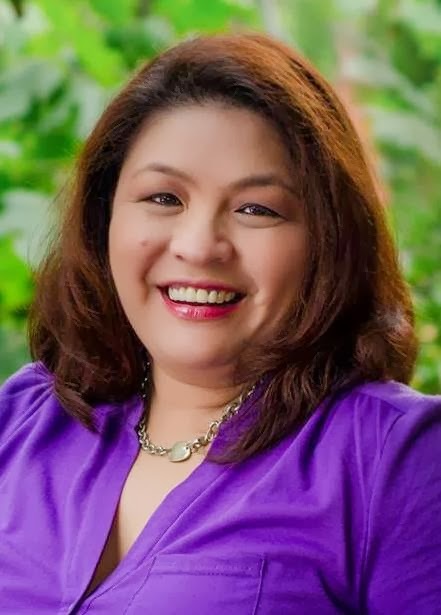 ﻿I was asked by a representative of Meat and Livestock Australia, a trade organization representing Australia's red meat and livestock industry in Manila, to develop home cooked Filipino meals using Australian beef and Australian lamb. I was so thrilled to have this project and so I spent days in my lab (aka kitchen) experimenting and tweaking traditional Filipino recipes. To be honest with you, I was excited more in developing the lamb recipes. Lamb is something I don't have extensive experience with. I was thrilled having to cook something that is not so familiar to my palette. Australian lamb is tender and flavorful Because of its low fat content, it is becoming a healthy meat alternative. 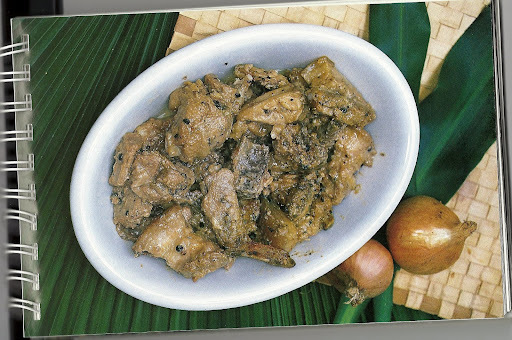 Lamb is not widely used in the Filipino cooking, unlike with Middle Eastern and Greek cuisine. An article online, Benefits of Lamb, offers valuable facts about the meat. With its healthy benefits, you may want to consider having lamb more often. So where else will I start but with the the dish that first comes to mind when we say FILIPIPNO FOOD. Yep, it is Adobo! 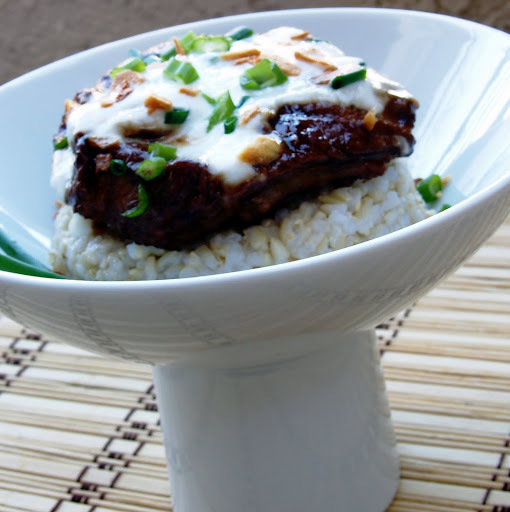 For this recipe, I have combined a quintessential Filipino dish, adobo and giving it a Greek twist. I used shoulder arm chops, a lamb cut that is more economical than the loin and still get the healthy benefits of eating lamb. In a saucepan, combine all the wet ingredients and crushed garlic together. Let it simmer. Add black pepper and crushed bay leaves. Allow the ingredients to fuse in together for a few more minutes then you are ready to add the lamb. Allow the lamb to braise for about 30 minutes or until the sauce is reduced to a very minimum. On the same pan, put rice (white or brown, it's ok). 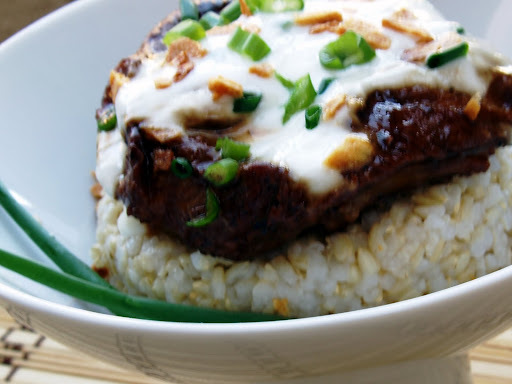 Mix rice thoroughly with the sauce residue. Add toasted garlic. Mix it altogether and use pour the lamb chops. "Loved your blog post," emailed Lauren of Lippe Taylor. She was referring to my ice candy treats that I just recently posted. 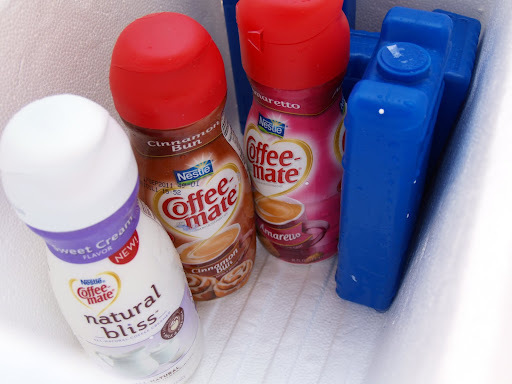 I used French Vanilla Coffee-mate to make the refreshing summer treat, and Coffee-mate just happened to be a client of theirs. Even before Lauren emailed me though I often incorporated Coffee-mate into the recipes presented on my blog. I just love the hint of flavors it evokes in my cooking and baking. "We just launched Natural Bliss, the first all-natural coffee creamer from Coffee-mate made with only four ingredients – milk, cream, sugar and all-natural flavor. There are absolutely no artificial ingredients, not to mention, it packs in all of the flavor without the added calories and fat (Only 35 calories and 1.5 grams of fat!). Natural Bliss comes in Vanilla, Sweet Cream and Caramel." Her email said. A day later, my kids called me while I was at work. "Mom there's a big box by the door" they excitedly informed me. Yep, it was a box full of Coffee-mate samples and I was more than excited to try them out. This morning, I saw loaves of bread in my pantry and I instinctively decided to make bread pudding. 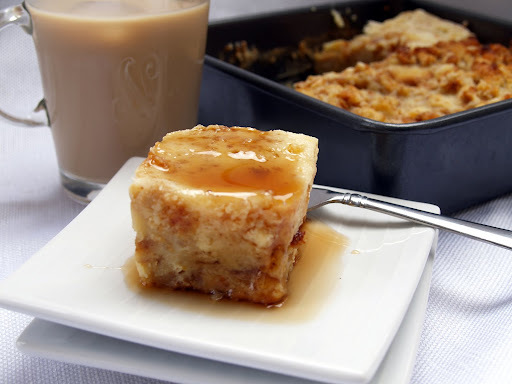 I have shared a bread pudding recipe here before, but this time I wanted to blend in the samples of Coffee-mate. For this recipe, I used the Natural Bliss Coffee-mate sweet cream flavor... and the verdict? 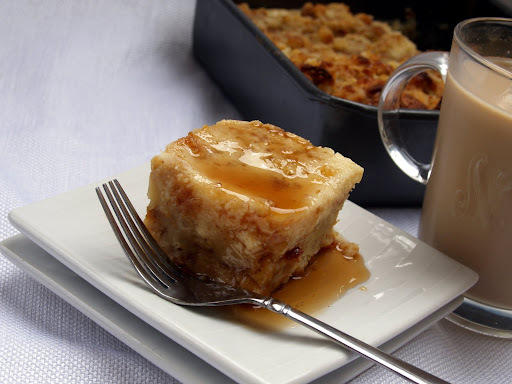 Let's just say that my kids loved the feeling of waking up one summer morning with freshly baked bread pudding waiting for them in the kitchen. Every bite of this desert was indeed NATURAL-ly BLISS-ful. This recipe is an off-shoot of my husband's paternal grandmother. She gave me this recipe almost 18 years ago. In a baking pan, pour sugar and caramelize. Set aside. In a mixing bowl, mix the evaporated milk and condensed milk. Add the eggs and gently mix it together. Add the bread. I tear the pieces by hand and I make sure it is chunky. Pour the mixture into the pan. Bake it in a baine marie for about 30 minutes or until cooked. I always use the "toothpick" technique of checking. You know it's done when you prick the bread pudding with a toothpick and the toothpick comes out clean. Our town fiesta falls in August. At this time of the year, people in my hometown of Tuguegarao are busy preparing all sorts of activities to celebrate the occasion. I heard that they celebrate it with a lot more fanfare than when we used to party when I was growing up. Whenever the month of August comes by, I always ponder upon all of my fiesta memories. Our school would be busy preparing for a big parade. Our marching band would practice longer than usual, while participants of songs and dances are also busy practicing in all corners of the school. A carnival and circus would come to town and you could hear their loud announcements inviting people to attend. The blaring sound of music and merchants calling customers to buy their wares promising a good bargain. The church would also be busy preparing its grounds for the converging of people to celebrate the event with a Holy Mass, because after all, fiesta is the feast day of a patron saint. In our case, our patron saint is San Jacinto (St. Hyacinth). While the town is busy preparing, houses would be just as busy getting ready for out-of-town visitors. It's actually like an open house where people are invited to come join in on the celebration. The iconic dish on everyone's table? 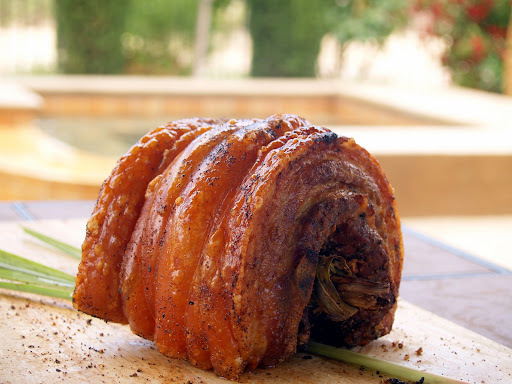 Lechon, you bet. And so, it may be because of the coming of our fiesta that I had this intense craving for lechon. 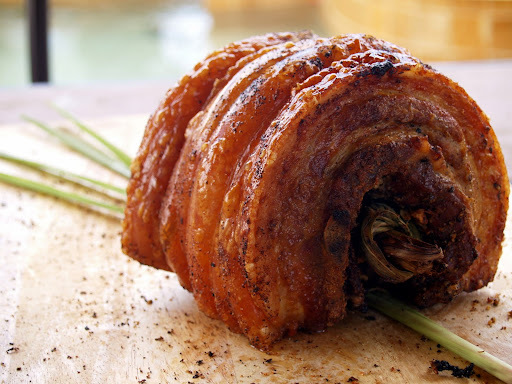 But since my oven is not big enough to contain the whole pig, I just have to contend myself with pork belly. It's a good alternative to the whole roasted pig. And what matters most is that it gave me back the echoes of our town fiesta. It's crackingly good... now watch the slideshow on how to do it... enjoy! I can't believe it's been a month since I started this new feature on my blog. As you've noticed, most of the past guest bloggers were children. And so when I invited Lilly to guest blog, she said that she wasn't a suitable candidate for the assignment. I, of course, reassured her that I do not have an age bracket for my guest bloggers. I just love the idea of kids cooking and baking, but for the next posts let's hear from "mature" guest bloggers. For this week we have Lilly. She's a retired pediatrician who I met almost 4 years ago. She travels from coast to coast to visit her grandchildren. She's funny, sweet and so full of life. When I asked her for a picture to go with this post she declined, saying she doesn't want the paparazzis to spot her. LOL! And so since she told me not to divulge too much about herself, without further adieu, I present Lilly. Friendship knows no boundaries. Case in point, my friendship with Malou. We meet only a few times a year but every time we do meet, we feel like we see each other everyday. So how on Earth did I come to know her? So here's our story. We met almost 3 years ago at a nail salon. She was busy reading a magazine and dozing off to sleep when I asked her if she is a Filipina. She answered me with a question. "Did you think I was a Filipina because of my accent?" she asked. "How could I tell your accent? All you did was smile," I replied. "No I am an Italian," she said. But then she giggled. "No I'm just kidding. Yes I'm a Filipina. How about you? Are you Korean?" she asked back. "No I'm French" I joked. "Ok darling, let's do the usual introduction," I said. "My name is Lilly and you?" "Malou. As in Skip to Malou," she said. A week after, we bumped into each other at Macy's. She came up to me and said, "Hey I know you. You are the French woman I met at the nail salon." And we laughed. I said, "you are Skip to Malou," because that honestly stayed in my mind. She asked me what perfume I used because she was looking for one for her grandma. She asked me, "how old are you, Lilly?" To which I replied, "hey you young lady, never ask a wrinkled woman her age. And she laughed so loudly. We stood there chatting and chatting like old friends but mostly we talked about food and our family. The sales clerk asked us how long we have been friends and couldn't believe that we just met. "You might as well be friends now," the clerk suggested. And we took that advice to a tee. Our friendship bloomed through a series of lunches and recipe exchanges. A year later, she tells me she came up with a blog. I wasn't surprised at all that she named it Skip to Malou. I am honored that she invited me to guest blog. I think that Malou and I hit it off well because we both love our food. We talked about food while eating food. We come from different ages and different cultures; different, yet we still share the same joy in cooking for our families. We started off sharing food with one another, and now on our plate is a friendship that will last forever. First, chop garlic, green onion and asian pear together in a chopper or blender. If you want a smooth texture go ahead, chop until smooth. But if you want some texture just a little pulse will do. Add soy sauce, sugar and sprite into the mixture. Salt and pepper to taste. The following day you are ready to cook in a pan. Make sure to get the pan really hot so it gives the beef a good sear. 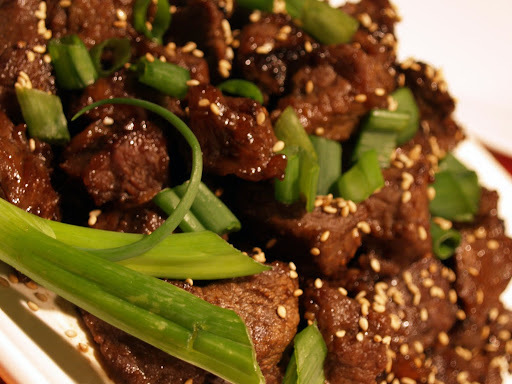 Add sesame oil and sprinkle sesame oil and green onions on top. If you noticed I tried to make my beef look the way Malou plates her food. But sorry Malou, this is the best I can. Thank you Lilly for a wonderful guest post. You said you will scare my readers away but I don't think so. Right guys? I truly enjoyed reading it. What do you think guys? Til next week's Geust Post Wednesdays!!! My family and left-overs don't go well together. My husband doesn't want to come home to what he calls "instant replay" and I think he has passed that sentiment down to my children. I, on the other hand, don't like pitching left-overs, so I cleverly work them into new dishes. I don't waste good food and, more importantly, my family enjoys what they believe is a completely different meal. It's a perfect win-win situation. Plus, as a result, I have developed a gift of improvisation... especially when dealing with left overs. 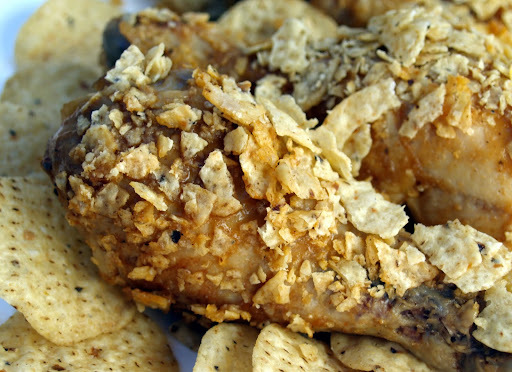 I could come up with a list of dishes here but instead I will share just one of my favorites: the Chip and Salsa Chicken. With football season about to begin, I'm sure there's a chance that those ginormous-sized chips will be left on the table overnight and will become rather stale. So here's a great way to re-use them. Season chicken with salt and pepper. Bake it for 20 minutes. Brush the salsa all over the chicken and bake for another 10 minutes. 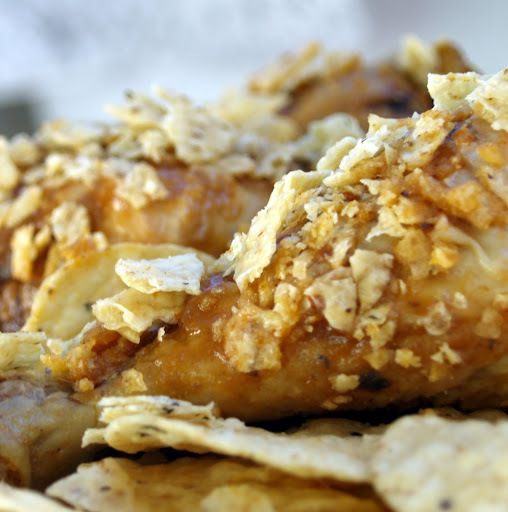 Take the chicken out again and brush another layer of salsa, and then roll it over the tostitos crumbs. Bake for 20 minutes or until chicken is cooked. Great fo dinner or great to go with your cerveza. I hope you are having a great Monday!